We are constantly striving to improve the Peer Lending experience for LendingRobot clients. In addition to simplifying the investment process, this includes attempting to generate higher returns with only marginal increases in risk. Those familiar with finance will recognize such concepts as the risk/return tradeoff. In the following article, we compare the risk/return profile of LendingRobot selected loans to that of the Lending Club platform. A lengthy discussion of our methodology for how we select loans for our analysis can be found in this article about diversification. Data relating to Lending Club and LendingRobot are grey circles and purple squares, respectively. As investors, we want to increase returns with only small increases (or preferably decreases) to risk. On the following plots, this translates to us wanting to move upward and slightly to the right, or any amount to the left. First, we take a cursory look of how we compare to Lending Club in aggregate. 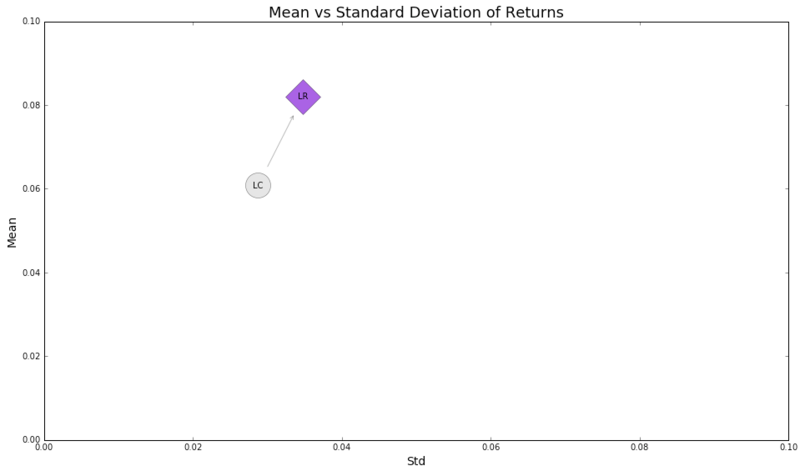 We see that LendingRobot generates a 2.1% increase in returns for an increased variability of returns of only 0.6%. This does not come as a surprise since achieving greater returns generally requires one to accept bearing more risk (there’s no free lunch!). A short digression: should an investor be tempted by higher returns and invest in riskier loans? Here’s where diversification comes into play, reducing the impact of any single loan on the portfolio’s return. It’s a good thing that with LendingRobot’s automation, diversifying across hundreds of notes only takes a few clicks! Returning to our original topic, there’s nothing particularly surprising at the top-level view so let’s get more granular. Now more interesting things are going on. Again, as an investor we would like to increase our returns with minimal increases in risk exposure. For grades D, E, F, and G, LendingRobot achieves this as there are increases to returns with minimal increases or even decreases to risk. 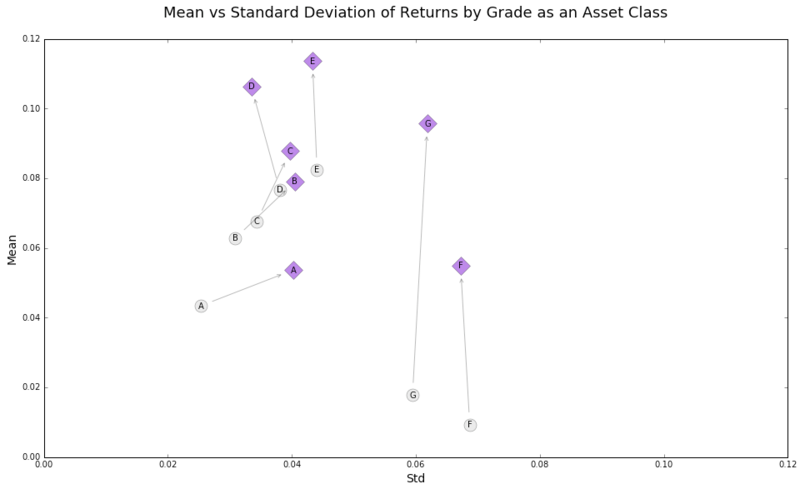 For grades A, B, and C, LendingRobot increases returns at a greater relative risk tradeoff than for the higher grades. It appears that LendingRobot does well in the riskier loan grades, and we can confirm this by examining the subgrades. In this plot, subgrade A1 corresponds to 1, A2 to 2, etc., and G5 to 35. Following the data can get hairy, but all the LendingRobot points (except 31 or G1) move upward compared to Lending Club, and about half of them have less risk and move to the left. We can also see that Lending Club has six subgrades whose returns are near zero or negative. Of those six, LendingRobot has increased three of them into positive returns, two to near zero, and one whose return has declined. Direct comparisons of Lending Club grade/subgrade to LendingRobot grade/subgrade are more easily visualized via heatmaps. Green shows that LendingRobot is doing “better” (more return or less risk) and red, the reverse. Areas where LendingRobot is performing well are where the mean is green and standard deviation is anything from white to green. The heatmap confirms what we saw above; that across almost all the subgrades LendingRobot increases returns, and for many it does so without adversely changing the risk. G1 (31) is an obvious exception, where LendingRobot seems to have negatively changed its risk/return profile. This underscores that G1 loans definitely have room for improvement, but it is important to keep in mind that there are only a small number (50 total) of G1 subgrade loans included in this analysis so it is worth reexamining at a later date with additional data to confirm our findings. So to summarize our findings, LendingRobot achieves higher returns in riskier subgrades without sacrificing much in terms of risk. 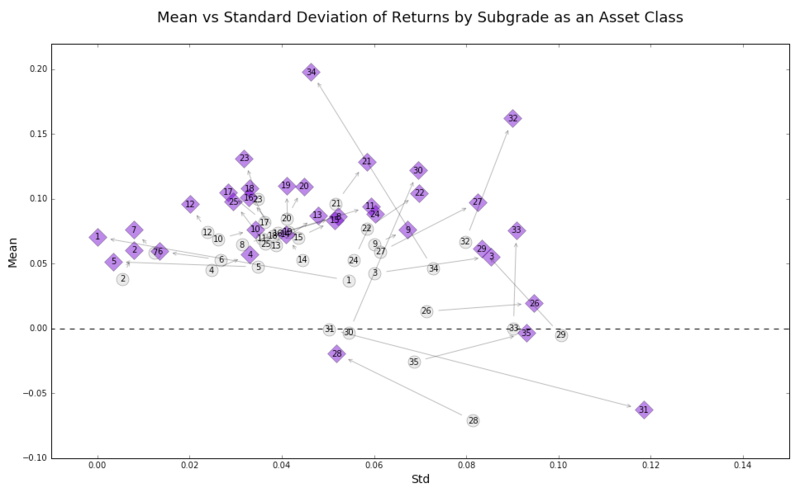 We also see increases in returns for the more conservative subgrades with a greater risk/return tradeoff than for higher grades. Conceptually, this makes sense; to squeeze out any extra returns from already non-risky loans, the relative increase in risk would appear large. We’ll take this information and show how to use it for diversification in our next article. The graphs are great. You mentioned that G1 has only 50 loans being analyzed. Can you provide the number of loans analyzed for each sub grade? Hi Clete! Here’s a breakdown of the loan counts at the platform level. Keep in mind that LendingRobot picks are the top quintile of LendingRobot Scored loans so divide the counts by 5 for the number of loans that LendingRobot analysis is covering. It is definitely worth doing the analysis again when there are more mature loans. Hal – How do you define the “Lending Club” and “Lending Robot” cohorts? What “rules” is Lending Robot using? What is the time frame for the comparison and how are the returns calculated? Lending Club A’s are all done A grade loans that are old enough to be done. LendingRobot A’s are a subset of the Lending Club notes, chosen by LendingRobot scoring all of those A grade loans and picking the top 20%. The time frame was loans from platform inception to loans issued 3 years before the post date (so there’s no estimation left on the performance of those loans). Returns are calculated by aggregating the size-standardized cashflows for all loans in the cohort and calculating the annualized IRR.